First things first...Johanna won my leftover Walking on the Wild Tide contest and the yarn and a little something else are winging their way to Canada. Second, I finished my Monkeys! These went so fast I couldn't even believe it! 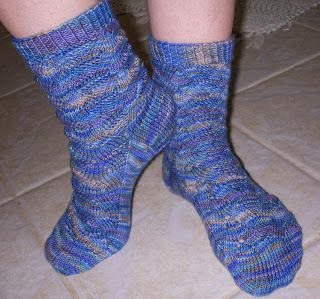 I really love the colorway and the way it works with the pattern. I think I may do another pair of Monkeys, but probably toe-up....stay tuned. Twelve years ago this month I was staying in a little youth hostel in Monaco with a view of the castle from my tiny window. The streets were abuzz with the upcoming Grand Prix, grandstands and barriers being erected, roads freshly painted with race markings. 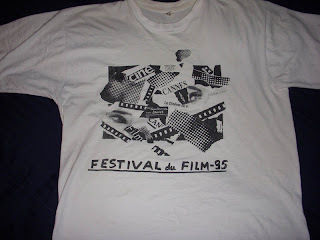 My friend Megan and I took the train to Cannes one day, saw some interesting displays about various movies being honored, bought a t-shirt, saw Barbara Hershey and Peter Gabriel walking down the sidewalk. Not together. I started to realize that travel during the months of April and May is a recurring theme in my life--1994 found me in Singapore/Malaysia/Thailand/Vietnam, 1995 was France/Spain/Monaco/Italy, 1997 a return to Italy, 2002 Japan/Thailand/Cambodia. From a practical standpoint, April and May are 'shoulder seasons' when travel may be a bit less expensive, but for me it was more about starting new chapters of life. Leaving the country, I often felt lost, aimless, unsure of what direction I wanted my life to take. Each time I returned stateside with a renewed sense of self and a confidence about what lie ahead. As May 2007 comes to a close I find myself floundering once again. If I were single and childless, I know what I would do--grab my passport, backpack and a Lonely Planets guide to somewhere. I am not saying I wish I were single and childless, as my husband and son mean more to me that anything else in the world and enrich my life in countless ways. But I struggle with finding a way to capture that confidence, take a quantum leap forward, overcome the aimless uncertainty. Travel made it easy because of the giant step outside of Me, the Me defined by my day-to-day life in the USofA. Just days in a row of self-discovery through meeting new people and new challenges, discovering amazing works of art in world class museums or climbing ruins in Cambodia, bungee jumping or finding a public bathroom. Everything I "own" for the moment fits in my backpack and has a use. Each day is new and different. I gain perspective on who I was when I left, what I have discovered about myself while away, where I see myself headed. At some point, the desire to return and start fresh hits. Not a feeling of being homesick, but an excitement about stepping back into Me albeit a changed Me, a fresh Me. The challenge for me is how to accomplish something similar within the context of wife, mother, inability to take 1-5 months off to travel alone....? Wow! You really flew through those monkeys. Sounds like you like the pattern. I'm trying to think of something to make my Sockapalooza pal. Maybe monkeys? Holy CRAP you knit fast!!! Love all the socks!